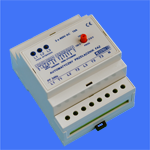 Phase changers guarantee continuity of power supply to singlephase receivers if 3-phase mains are available. Decay of voltage in hot phase of power supply to the equipment causes automatic switch-over to the other phase. Once the supply voltage has been re-applied, the relay may switch over the power supply to the phase selected as the basic one or remain in the phase of the best voltage characteristics.